We love Babar. We've got some rather special Babar loveliness coming up on the blog very soon but today we're looking at Babar and the Wully Wully, a fantastic story that highlights all the reasons why Jean De Brunhoff's peerless Elephant characters are still so timeless and brilliant 80 years (yes, 80 years!!!) on. Babar the Elephant is king of a wonderful realm, living in perfect harmony with his elephant subjects. However, things aren't always perfect in paradise - a tribe of rhinos, led by the grumpy and curmudgeonly Rataxes are always causing trouble. So when Babar's children Pom, Flora and Alexandra find a strange creature while out playing in Celestville, they bring him home as a well-loved pet. The Wully Wully is cute and charming, and loves life in Celestville, but the evil Rataxes watches with an envious glint in his eye, and can't wait to kidnap the Wully Wully for himself. Needless to say, Wully Wully does not have a happy life living amongst the rhinos. He's kept in a cage, or on a lead, and is thoroughly miserable. So it's up to the bravest elephants and their monkey chum to mount a rescue mission. Trouble is round the corner though, when Rataxes finds out - and declares war on the elephants. Things look grim, but can Flora change the course of history before the elephants and the rhinos fight? 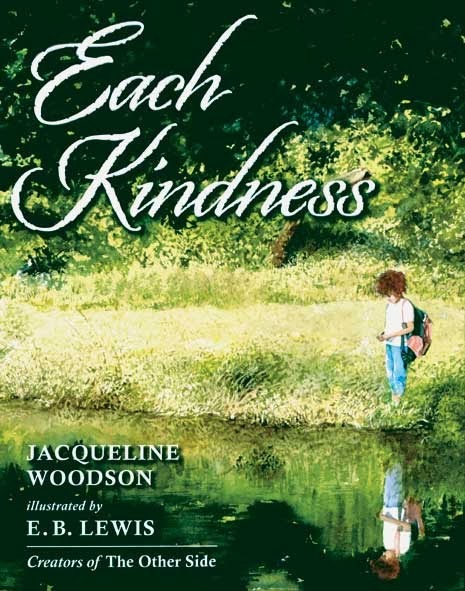 This is a truly wonderful book, teaching children why sharing and kindness are important - but also that fighting and war are not the only answer, sometimes diplomacy and discussion can win out. I've often said that Jean De Brunhoff was a time traveller, who leapt back in time to the 1930s to begin writing his stories, because they feel so contemporary (with a few odd anachronisms of course) and their messages are utterly important, even today. 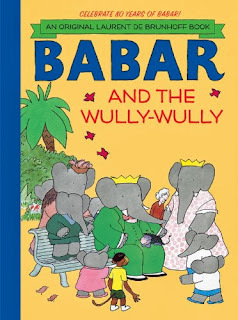 Beautifully illustrated as ever, with a cast of engaging characters, we just cannot get enough of Babar and his friends. 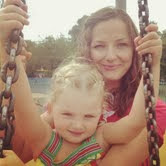 Charlotte's best bit: The Wully Wully is so cute! I hadn't the heart to tell her that she can't have one for Christmas. Daddy's Favourite bit: Sharing, compassion, diplomacy, war, you name it, Jean De Brunhoff expertly makes it accessible and understandable by children of all ages - which is why the Babar books are so durned special. Do not miss out as they're steadily being reprinted! We love Colin McNaughton's books but somehow this 1991 classic (now, hooray, reprinted this year with a fab new cover) evaded us until now. How glad are we that we've finally 'met' "Have You Seen Who's Just Moved In Next Door To us?" (bit of a mouthful of a title, no?). As you'd expect from Colin, it's a superbly detailed rather cheeky and irreverent little children's book that layers on the laughs as we progress through a story of chinese whispers. A house is up for sale and someone's moved in - but who? All the characters in a really bizarre street are lining up to catch a glimpse of the new neighbours. King Kong cadges a glance, Tarzan and Jane swing through the treetops for a peep, even Mrs Nasty at the hat shop has a squint through her glasses at the newcomers. The rhyming text is perfect, but the real hoot comes from all the tiny bits of dialogue Colin works into each frame as all the characters chatter and gossip about the new neighbours (there's an absolutely delicious reference to one of our all time Janet and Allan Ahlberg books early on that should give you a nice giggly glow). We always try to ensure that our book of the week choices are books that are demanded again and again (often consecutive readings are demanded, which is fine by me as there's so many tiny little hidden details in this that you won't get first go). There's a moral too, perhaps Colin predicting the downfall of 'neighbourhood' and the segregation of folk who live in close proximity? Don't struggle too hard to read between the lines though, this book is a riot in all the good ways possible. Charlotte's best bit: Unfortunately it's the rather cheeky and rude bit where a Doctor Doolittle wannabe is teaching his exotic bird collection how to say extremely rude and naughty things! Daddy's Favourite bit: "My Hero!" - LOVED that bit. 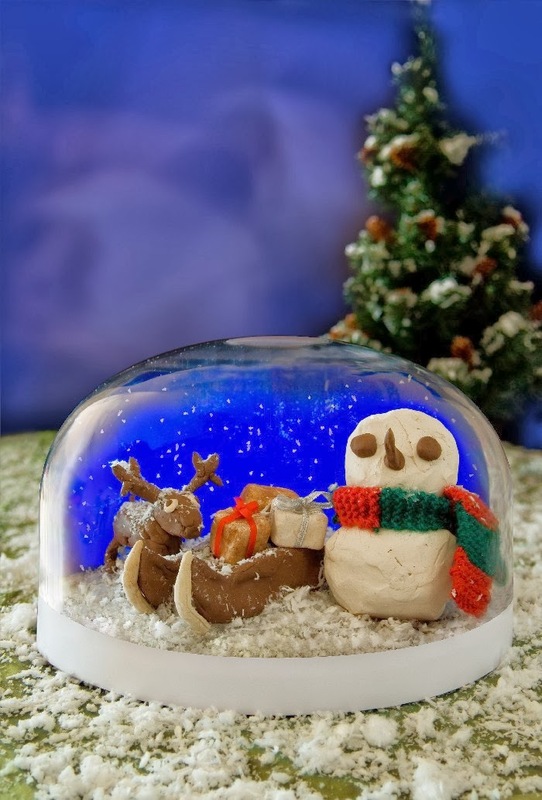 Discover Story's "Christmas Claytime" starts this weekend! Don't miss a squidgy feast of festive fun! Our good friends at the fabulous Discover Story Centre in Stratford, London have exciting things afoot for Christmas - starting with a fabulous event running on the 30th November, and also continuing on the 1st December. 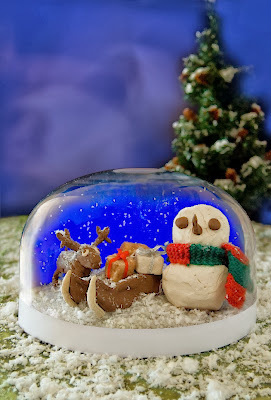 "Christmas Claytime" is a show for children under 7 performed by the award-winning Indefinite Articles. As part of the performance, the audience is asked for story ideas then the performers mould the story out of clay and act it out on stage – it’s great fun and very interactive. To find out more about the Discover Story Centre, drop by their website and discover a wealth of fabulous stories, a brilliant environment to stimulate children's minds and also give them the opportunity to run around like whizzpoppers in some of the interactive areas. Have fun, and do let us know if you make it to the events, we'd love to hear from you! 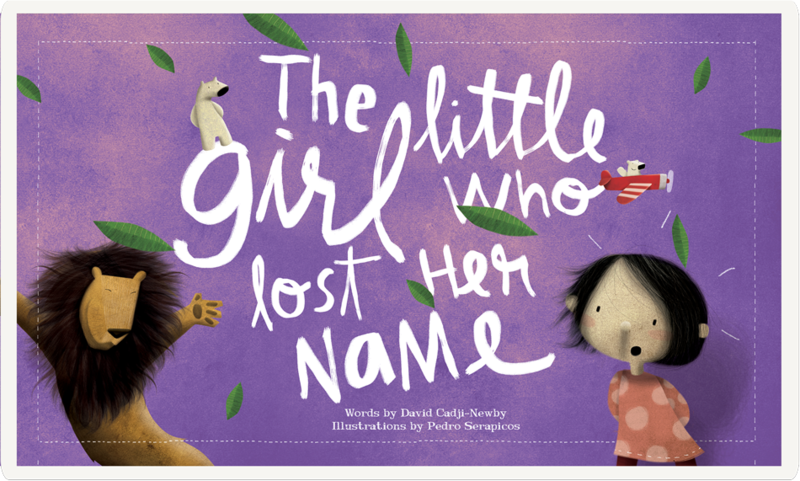 Indie Pen-Dance Wednesday - A great guest post from one of the creators of "The Girl / The Boy Who Lost her / His Name"
Today for our Indie Pen-Dance Wednesday we're featuring a guest post from David Cadji-Newby from "lostmy.name" - genius creators of a name book with a difference. 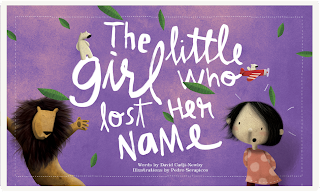 You can check out our review of "The Girl Who Lost Her name" but now it's over to David to tell us a little bit about what reading with his son means to him. "OH GOD NO NOT THAT BOOK AGAIN!" I don’t know about you, but for me, there was this one book. Don’t get me wrong, it was a good book. One of the best. I remember enjoying it the first, ooh, twenty times I read it to Elias. But every night? ‘What book would you like?’ I’d say. I ended up sounding like a desperate call centre worker trying to hawk double glazing. And it never worked. He wanted that book. And I had to read it to him, otherwise I’d be a bad dad. So I had to come up with strategies, to get through it. Do silly voices, that was one. Really start interrogating the stories, look for subtext. Hippos can help with a letter. Guess which one! But here’s the thing. The older and more familiar the book got, the more I had to interact with Elias to get through it. And looking back, we talked so much and learned so much together, that it was more than worth it. I wouldn’t have missed it for the world. Bedtime stories are on the wane. Parents are reading less with their children. Kids are spending more time in front of screens. Which we think is a shame. Reading a story with a child is such a magical thing. And it’s over so quickly. Too quickly. By gad, it's a B! Now, Elias reads on his own. And he’ll come out with things like, ‘Did you know the Roman god of the sea is called Neptune?’ And I’ll say, ‘How do you know that?’ ‘Oh, I read it,’ he’ll say. And while I’ll be proud of him for knowing it, and impressed by his reading (he’s only seven after all), a part of me will still wish that maybe we could have discovered it together. Even if it was in a book we’d read together, like, a gazillion times. People often ask us why we cover independent and self published books. Books like "Whooossshh!" are why. When author Vanessa Lees got in touch with us to describe how her book was 'born' it definitely struck a chord. Her hubby had wondered why dads always seem to get missed out when it comes to children's books and you know, he has got a point. Far too often we see mums and kids taking centre stage while dad is tucked away in a corner, often grumpy, often used for comedic effect but never sharing the limelight. Until now! Vanessa set to work, and has produced a vivid and wonderful rhyming book that redresses the balance - and I rather love the fact that the dad in this book does what a good dad should, provides a broad pair of shoulders for shoulder carries, spurs Audrey's imagination on flights of fancy and provides a rich tapestry of stories to enjoy. Yes, we really like this fellah a lot. Helen Mather's illustrations also give "Whooossshh!" a rocket-boost as we see Audrey musing on being short, and wondering about all the things she could become when she's older. An astronaut? A bear even? Who knows! We loved the scribbly big "Whooossshh!" pages in between each rhyme to give children a nice colourful spread to shout along with. We have a soft spot for dad-and-daughter books (you can sort of understand why), particularly books like this that show other folk exactly what they're missing out on if they overlook indie and self-published stuff. It's charming, dreamy, imaginative and sublime! You can pick up a copy of "Whooossshh!" from Amazon or from The Odd Sock Publishing via their supercool website. Vanessa Lees is a copywriter, journalist and more recently an author with her debut picture book Whooossshh. The book was inspired by Vanessa’s husband Daniel who was becoming increasingly irritated by the lack of dads in picture books and although she thought he was being precious, she did begrudgingly succumb to the fact that as usual, he was right. Vanessa rectified the problem by sending Daniel and their daughter Audrey on a magical adventure to the Milky Way. 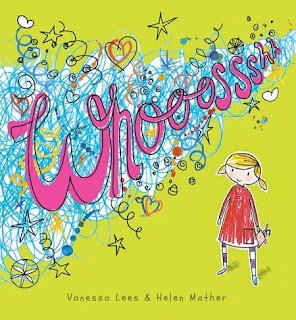 Whooossshh has also taken Vanessa on a journey to book shops and primary schools, where she holds book readings and Whooossshh inspired creative writing workshops for children. Charlotte's best bit: Hairy legs and scary legs, and a super-cool dad! 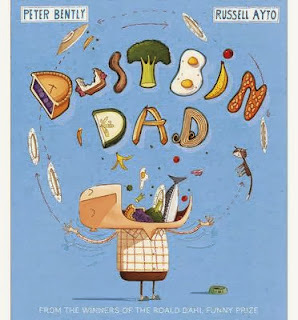 Daddy's Favourite bit: Hooray, a book that celebrates imaginative dads and their awesome daughters. A huge thumbs up from us! It's always so brilliant when one of our Twitter mates does something cool and groovy that we can get behind. For a very long time Charlotte and I have loved Louise Forshaw's illustrations. Packed with colour, distinctive in style - but above all a huge amount of fun! So seeing Louise make it into print is fantastic - we predict great things! So what's Louise's first book all about? Dogs, or more accurately cute little pups. 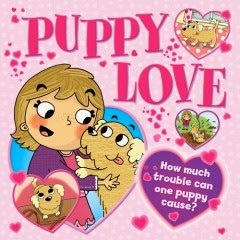 We know she draws with an expert eye as the owner of a rather cheeky little Jack Russell scamp herself but what's not to love about a pup called Little Paws who is given as a present to a little girl and instantly becomes her best friend. 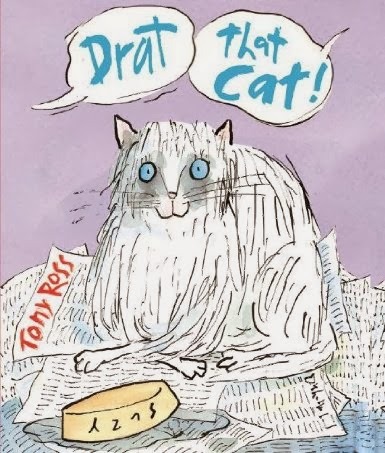 Louise illustrates the story, told in rhyming text, and her trademark tight linework and fab colours and textures helps little paws practically leap off the page to lick your face until you giggle and squirm. Charlotte is at that age where, if we let her, she'd run a menagerie with 20 guinea pigs, a brace of cuddly bunnies, perhaps even a Giraffe or an Alpaca - but I think now she'd also love to make room for a cheeky little doggy pal too! Daddy's Favourite bit: Cute, colourful and a bouncy rhyming story that's as full of energy as a puppy and definitely as loveable. VERY nice work Louise! We're joining in with the "Piggy Blog Tour" courtesy of Scholastic and Emer Stamp. We've been reading (and chortling muchly) at Pig's antics in his new book "The Unbelievable Top Secret Diary of Pig". 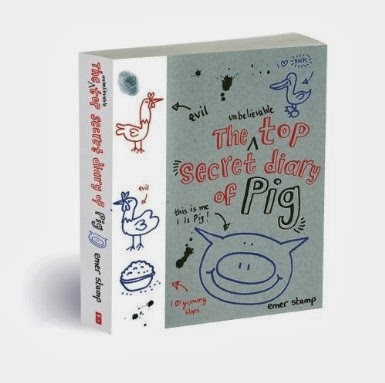 But just what does an ordinary everyday pig get up to that's worth scribbling about with a talented trotter in a diary? Lots. Lots and lots! Pig's best friend is Duck (and I'm sure if you met duck, you'd want a best friend like that too!) Pig lives on a farm with the farmer and his wife, and is such a good natured little soul that everyone likes him. Except...the evil chickens. Boo! Hiss! Cluck! They are always pecking pig, stealing his food (and duck's food too, the rotters) and they don't stop there. You truly can't trust a chicken at all, so when the chickens hatch (oh pun intended, yay!) a plan to get rid of pig once and for all, requisitioning the farmer's tractor and pig's digestive tract, no good will come of it. When pig finds out why he's the only pig left on the farm, and where sausages come from, he's rather alarmed. With good (or bad - depending on your point of view) timing, the chickens are readying their Tractorocket to blast Pig off to another planet! Eek! A fabulous, funny and brilliantly told story that's a blast for early chapter readers like Charlotte who crave plenty of visual stimulation (brilliant little piggy doodles and funny maps) to go along with their books. Pig is so loveable and naive that you just can't help rooting for him (when he's not rooting around in rubbish bins or mud, eeks!) and hissing at the rotten chickens who really should be on the menu instead of pig. More pig soon please Emer, we loved him to (bacon) bits! Charlotte's best bit: A morbid fascination with Pig's rather unique way of powering the awesome Tractor Rocket. Ewwww! Hold your nose! Daddy's Favourite bit: Fun, crazy, humorously told. If Adrian Mole had been Adrian Pig instead, this is how we'd imagine him! Reading to children - One of the most rewarding experiences ever? You betcha! Michael Morpurgo has long been a legendary figure in children's books so who better to act as a spokesman for ensuring that reading to children goes on in schools way past nursery, preschool and reception. We were quite shocked to find that Charlotte's school treats reading purely as a means of improving literacy now that she's reached year one. 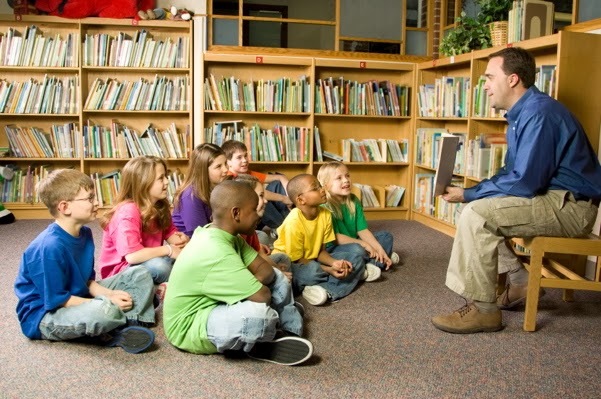 There are (woefully infrequent) visits to the school library but no story time, certainly no teachers-reading-to-children story time and that's pretty surprising really. Many other parents (thankfully) ensure that children do get plenty of opportunities for story time out of school, but it feels odd to think that school is somewhere children spend such a huge amount of time, but are missing out on what I believe is a vital part of contributing to who they are and who they will eventually become. Surely through stories we discover more about the world, and a lot more about ourselves - and of course in story sessions where children can contribute and interact with the storyteller (the best type of reading aloud) they get to discover a little bit about their peers too. If by some sheer stroke of luck I was ever in a position that I didn't need to work long hours to pay the bills, I'd gladly volunteer to read stories to children in schools for the sheer love of it. Being given the opportunity to share stories, and perhaps give children who have little or no love for books at home a few glimpses into what they're missing out on would be a far greater achievement than crunching code or ensuring that yet another person gets to spend a huge amount of money on some vanity computer purchase. To those schools who do nurture an environment where story time goes on beyond the age of 5, I stand up and salute you. You are bucking the trend where academic excellence is seen as the only measure, where testing and parrot-fashion learning are seen as the only choice to ensure that we won't be left behind in some nefarious skills 'arms race' that seems to be the way the government would like things to be. The same salute goes out to Michael Morpurgo and all the storytellers, illustrators and book folk who also believe the same thing - children need stories, and that need does not evaporate as soon as they hit 5. #ReadItMD13 Theme Week - "Food Glorious Food! Children's books with a foodie theme!" 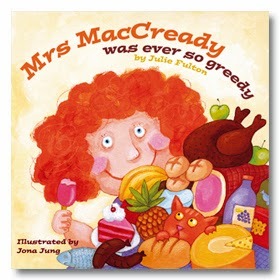 "Mrs Macready Was Ever So Greedy" By Julie Fulton and Jona Jung (Maverick Books). Scoffing! Ahhh food glorious food, what better subject for a book than scrumptious scoff! We're coming to the end of our year's worth of special theme weeks - encouraging parents to read more to their children but we couldn't end the year without a good hearty meal or two! "Mrs Macready Was Ever So Greedy" by Julie Fulton and Jona Jung is so full of juicy, tempting, tasty and plentiful grub that we had to have it in our list. From the delicious end-papers to the meals that Mrs Macready tucks into, it's a smorgasbord of scintillating sizzling flavours. Mrs Macready loves food a little too much though, and as her waistline expands - and even the newspapers become involved, life in Hamilton Shady will never be the same again. Brilliant, a bit grisly, but such superb fun, we love it and it's a regular guest at our bedtime table. Who's for a spot of breakfast....? Can I tempt you with something a little different than your usual bowl of Shreddies? "Green Eggs and Ham" is a complete riot from start to finish. I loved it as a kid, and it's been so fantastic to be able to introduce the masterful Dr. Seuss to Charlotte, and see her enthusiasm for his pitch-perfect rhymes and completely crazy scenarios. Here a hapless creature is pestered by Sam (I am) to try a most unusual dish. 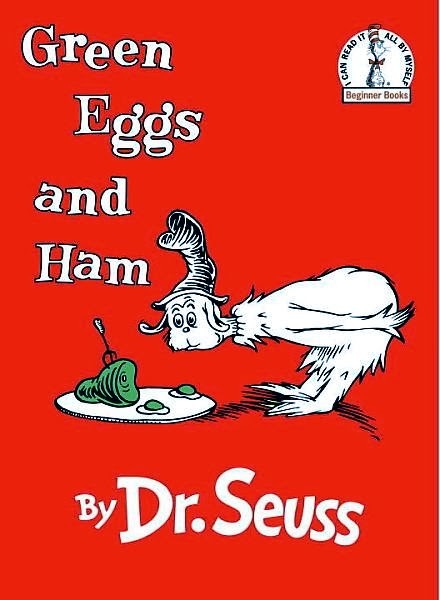 Green eggs and ham, whoever heard of such a thing! Sam insists it's the most tasty thing you can imagine but his cohort takes some convincing. Whether in a train or in the rain, on a boat or with a goat, the answer is the same - a firm no. But try it, try it - just this once...and...YUM! Charlotte likes to see me tripping over my tongue reading this and other Seuss books so it's become a challenge, to see if I can make it through without fluffing. I haven't yet! "Dustbin Dad" by Peter Bently and Russell Ayto. You name it, he wolfs it! 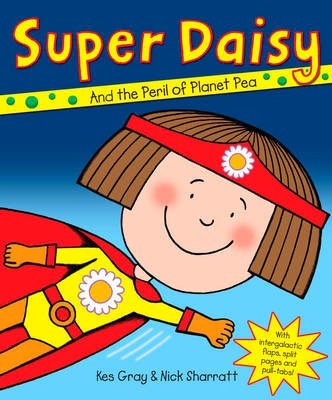 "Super Daisy and the Peril of Planet Pea" by Kes Gray and Nick Sharratt. Pea-culiar! Peas. You could probably create a whole theme week geared around this tasty veg but a certain would-be superhero probably wouldn't be too impressed. "Super Daisy and the Peril of Planet Pea" by Kes Gray and Nick Sharratt - one of our favourite dynamic duos in children's books - features our long-suffering heroine as she battles the nefarious forces of Planet Pea, and the threat that peas will invade all Daisy's favourite foodstuffs - even ice cream! EWWW! 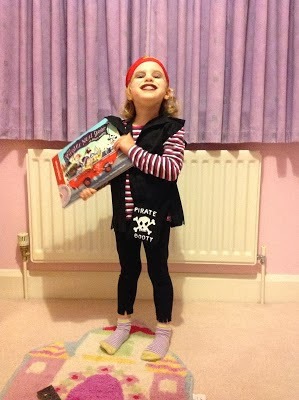 We particularly love Daisy's superhero costume, definitely an idea for the next Book Week at school! We'll be back as the week progresses with more tasty fare. Do you have a children's story book with a foodie theme? (not a cook book, stories are where we are at this week, have you ever tried reading a cookbook to a child at bedtime? Maybe we might try that!) We'd love to hear all about it so please do tweet us or drop us a comment. Oh and pass the ketchup, there's a love! Summer seems like a million miles away now, but as the final strains of Don Henley's "Boys of Summer" fade from my internal jukebox, this book pops through the door like a ray of fresh sunshine. 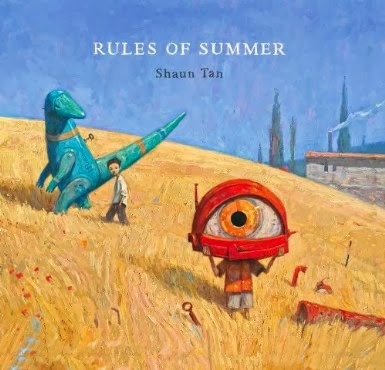 Shaun Tan's "Rules of Summer" is every bit as brilliant as we thought it would be. Though don't be mistaken, this isn't a book that instantly screams "sunshine" and "happiness" at you. This is a Shaun Tan book and as you'll probably know if you're familiar with the genius work of Mr Tan, you seriously can't judge a book by its cover (though this book's cover is utterly fantastic and entrancing nonetheless). How does Shaun Tan squeeze such brilliance from urban desolation? How does he mix child-like wonder and curiosity with sinister beasts and an ever-present feeling of danger and peril? How indeed. In "The Rules of Summer" two brothers live by a list of learned life experiences which are tinged with a surreal note of darkness. I always expect to love Shaun Tan's books instantly, but always wonder what Charlotte will actually think of them. Should children really be encouraged to embrace such dark works when really we'd love them to be happy sun-kissed little campers? She's shown me time and time again though that her taste for the surreal is as keen as mine. We've looked at my huge collection of Taschen books, at artists like Magritte, Ernst and Dali (with the odd parental filtering of some of the racier content), so she appreciates the work of Tan - who firmly establishes his own style as an incredible artist who just happens to produce children's picture books (are they really for children though? Certainly I could fully appreciate that not everyone's kids would find any worth in them but I'm so utterly glad mine does). As we journey through "The Rules of Summer", and discover the brothers doing what boys seem to do best (teetering along a knife-edge between good and bad behaviour, salvation and danger), the book's undercurrent seizes us and pulls us under the waves to speak in hushed tones of sibling love and rivalry. In any family where an older and younger child play together, you can imagine the conversations, the subtle power struggles, the fights, the making-up and above all the companionship the two children will experience until they're old enough to crack a wry smile and remember childhood. In essence, Shaun Tan has captured that - fused it with his expert eye into something that acutely describes where we stand in our own personal landscapes, and what we experience through them. Looking through the eyes of a child beyond what adults see as mundane or ordinary is a very neat conjuring trick, one that Shaun Tan seems to be able to perform at the drop of a battered old bowler hat. A truly beautiful eye-opening book in so many ways, and a thoroughly well deserved book of the week for both of us. Charlotte's best bit: "Never leave a red sock on the washing line"
Daddy's Favourite bit: "Never eat the last olive at a party"
Though we don't watch any children's TV at all any more, we have fond memories of The Octonauts. That brilliant bunch of undersea characters, with their own show based on the fabulous Meowmi books, have become something of a global success story. 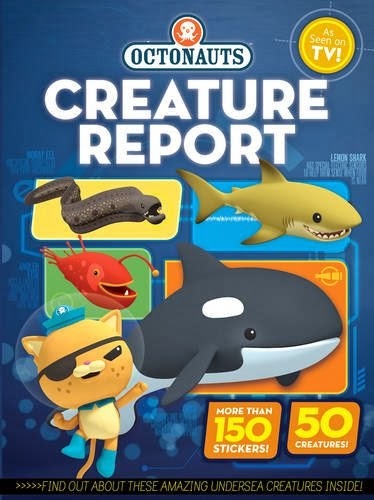 As an offshoot to the normal length episodes, CBeebies started doing very popular little shorts called "Creature Reports" and now you can buy a book that wraps up some of your favourite sub-aquatic denizens and also gives you a ton of Octonauts stickers to use in the book and on your own goodies too. The book is beautifully produced and very reasonably priced. Charlotte has absolutely loved it, and though it's a bit tricky for her to read on her own - it's been great fun for her to explore and stick stickers into. If you're looking for a stocking filler for your Octonauts-loving childfolk, this is an essential purchase. Charlotte's best bit: She seems to really love whales and sharks. A girl after my own heart. Daddy's Favourite bit: Top quality artwork, great facts and figures and over 300 Octonauts-ey stickers to stick all over everything. Bliss! "Puss in Boots" - A brilliant example of Cardooo's "Story Cards"
You definitely get an "ooo!" with Cardoo! When we were contacted by Cardooo who wanted to tell us all about their literacy and numeracy greetings cards, we leapt at the chance to take a look at their range. More than just greetings cards, Cardooo have a fabulous selection of cards for all occasions (including, of course, a really ace range of christmas cards). We took a look at the fabulous "Puss in Boots" story card, which is ideal for a girl or boy birthday. Inside the card as well as the usual greeting, you'll find a story for children to read (or in my case, for a daft dad to read out in a variety of silly voices). Combining great potted stories with fabulous illustrations and sneaking in a learning opportunity where you definitely wouldn't expect one, to children Cardooo cards aren't stale and educational, they're fun and story-filled. As you can see, it's quite a range but stop by the website for more cards and ideas including a range of Doctor Who cards, perfect for celebrating the show's 50th birthday with! 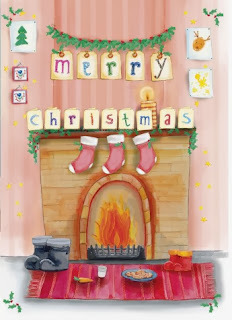 Cardooo''s "The Night Before Christmas" card. Fabulous stuff! Elves and fairies, pixies and brownies are characters that children can't get enough of and in the Whimsy Wood series, Sarah and Sarah (Author Sarah Hill and Illustrator Sarah Mauchline) have conjured up a magical world full of wonder and adventure. Posie Pixie is - yes you've guessed it - a Pixie and being pint-sized in a giant world can mean adventure is around every corner. 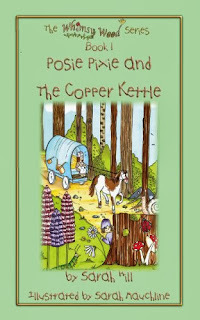 In "Posie Pixie and the Copper Kettle" Posie is searching for a nice warm place to call home as the cold weather approaches. Meeting many characters on her quest for the ultimate pixie-pad, Posie is a friend to magical characters and animals alike. We took a look at two books in the series (Posie Pixie and the Copper Kettle and Posie Pixie and the Lost Matchbox). Charlotte really enjoyed tucking herself away with the books to read them on her own. 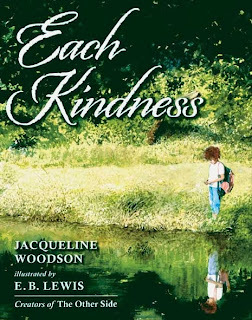 There are two versions of the story in each book, that give children of different reading abilities the chance to dip into the one that suits their ability best. Fabulously and imaginatively illustrated, and a huge thumbs up from us for donating 10% of the book's profits to The Wildlife Trust, these are adventures that will definitely appeal to children with a love of the great outdoors. Daddy's Favourite bit: Smashing little books that are perfect for early readers to dip into. Talking to the wonderful folk at Letterbox Library, it seems it's not just me that struggled to find children's books that tackle the subject of bullying in a satisfactory way. In fact, Letterbox Library have resorted to importing books from the US, and they've come up with a really brilliant list of potential purchases for parents and teachers. using the promotional code 'ReadItDaddy' with order queries. Rabbits are definitely Charlotte's favourite animal. She spent ages cuddling cute bunnies on our recent visit to Buckleberry Farm, so when we trawled the library she was overjoyed when her best friend Sarah found a cute bunny-based book to read. 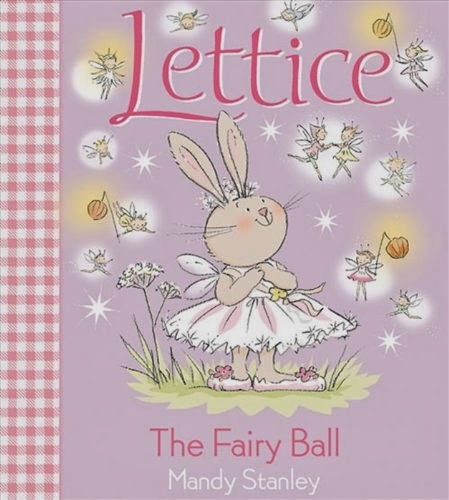 Lettice is the star of many stories with a range of books for 0-3 years, and a range for slightly older children around Charlotte's age. She is an inquisitive and cute bunny who loves to explore the woodland habitat where she lives with her mum and dad, and a huge number of brothers and sisters. While out exploring one day, Lettice is making daisy chains when she spies a tiny little creature clad in gorgeous clothes, glittering and sparkly. The little creature grabs the end of Lettice's daisy chain and disappears into a hole in a nearby tree. Lettice is too big to follow. 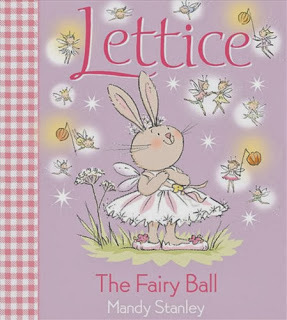 But with a touch of fairy magic, Lettice shrinks down to fairy size and joins them for the Great Fairy Ball. They give her a beautiful dress and soon the fairy queen arrives to thank Lettice for her daisy chain (now turned into a set of fabulous reins for the fairy queen's carriage). Before Lettice heads home, tired and happy, the queen gives Lettice a wish - a single wish for anything she wants. What does Lettice wish for? You'll have to read the book to find out. Normally I fail miserably at reading cute and very "girly" books to Charlotte but this entertaining story was great fun to read, and served me a valuable lesson in judging a book by its cover (it is very sparkly and more than a bit pink). Thankfully Lettice is such an endearing character and I loved her curiosity, standing out from her brothers and sisters who like snuggling and sleeping for most of the day. Charlotte, of course, loved the book to bits. With glitter-encrusted pages and lots of fairy magic, it was definitely a huge hit with her. 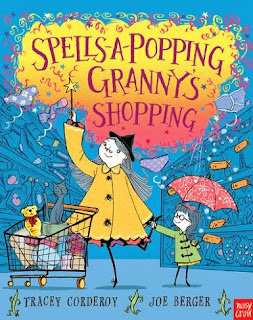 Seized on in an instant the moment we spied it in the library, we couldn't wait to get home and read "Spells a-popping, Granny's Shopping" from the dynamic duo of Tracey Corderoy and Joe Berger. 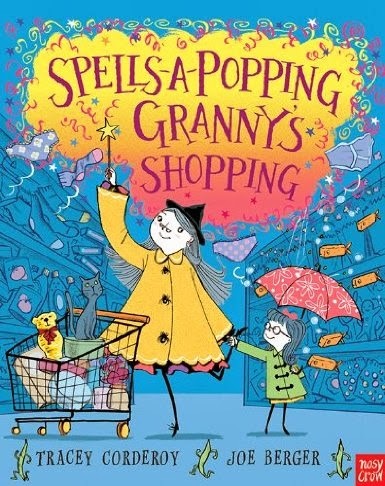 "Whizz Pop, Granny Stop" and "Hubble Bubble Granny Trouble" are firm favourites, so we definitely wanted to know what the magical witchy granny and her grandaughter Pandora got up to next. Mealtimes at Granny's house inevitably seem to involve froggy poo (ew) and animal antics, and with the cupboards bare there's nothing else for it but to go shopping. A simple trip to the supermarket for supplies seems fairly uneventful but when your granny is a dubbleyew eye tee cee haitch things can definitely take an unexpected turn. Granny's taste for mischief clashes with Pandora's wishes for simple grub like fish fingers and baked beans, and soon abject chaos breaks out as Granny waves her magic wand. We love these books so much, the fact that Granny is pretty naughty - and yet utterly cute (yes I still have a massive book-crush on her), and always finds ways to weave a little magic into Pandora's ordinary everyday life. But sometimes magic does come in handy when naughty robbers are up to no good. A real rollercoaster adventure ride from start to finish, with us still wanting to see more from Granny and Pandora. Once again there's the brilliant bonus of being able to scan a QR code and have a fabulous reading of the book to accompany you while you're flicking through (making Nosy Crow books essential for busy parents who don't mind plonking their children down with a mobile phone or a tablet and letting someone else read to their child). Magical stuff. Well done Tracey and Joe, you've done it again! Charlotte's best bit: The cheeky little animals who invade Granny's kitchen cupboards as soon as the shopping is put away. Greedy beasts! Daddy's Favourite bit: Fun and entertaining, and a slick production as we've come to expect from "The Crow". More soon please! #ReadItMD13 Theme Week - "Tackling bullying through Children's Picture Books"
To support National Anti-Bullying Week (18th-22nd November) we thought we'd devote this week's #ReadItMD13 Theme Week to this very tough and sensitive subject. As someone who was bullied at school, I know first-hand what it feels like to dread going to school, dread playtimes and lunchtimes - and sometimes even dread the journey to and from school too. When I was a child, methods of tackling bullying were wholly ineffective - reactive rather than trying to get to the root cause, punishing the bullies (if any action was taken at all) rather than trying to work out why it was happening. Things have changed a lot, and with national initiatives in tackling bullying - and the brilliant efforts of schools themselves to more effectively present a culture where bullying isn't tolerated but is also sensitively dealt with really feels like a huge step in the right direction. 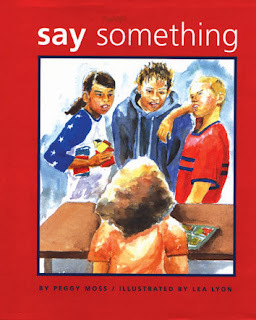 Bullying is a prevalent subject in children's picture books. Often characters associated with bullying are shown almost as grotesque caricatures, or in books where anthropomorphised animals are the key characters, bullies are often shown as predatory powerful animals who you'd normally associate with picking on the weak. "Trouble at the Dinosaur Cafe" by Brian Moses and Garry Parsons. T-Rex Trouble! 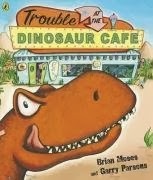 In "Trouble at the Dinosaur Cafe" by Brian Moses and Garry Parsons, the "Bully" is a fearsome T-Rex with a rumbling tummy who storms into the Dino Cafe one day and causes trouble. He's hungry for fresh meat and instantly picks on three other dinosaurs dining there, with the aim of polishing them off. In the book, a wily trouble-shooting Triceratops - a bit of a tough nut himself - stands up to the bully, and with the help of the other three dinosaurs they biff, bash and tickle the T-Rex into submission. When we first reviewed this book, we thought it was a bit of harmless fun - but re-assessing this book with a bunch of like-minded booky folk made me think again about its content and whether it does more harm than good. There is the positive message that standing up to bullies collectively is a strong action to take, but there's the mixed message that violence and submission - or indeed using sheer weight of numbers to turn things around - is a laudable action. With "Victorian Parent" sitting on one shoulder and the rather more carefree "Don't be so wishy washy" parent sitting on the other, it's a tough call to make, but the subtlety of books that deal with bullying is something to truly consider. 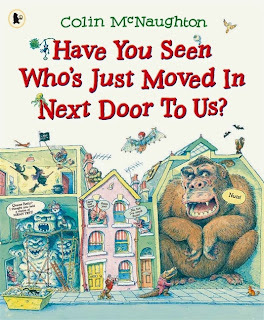 In "Mine's Bigger than Yours" by Jeanne Willis and Adrian Reynolds, the big monster relentlessly pursues and picks on the little monster, chasing her down and constantly harassing her for her lolly. All through the book the big 'bully' monster denigrates the little monster, until the very end when the big monster bully gets his comeuppance. 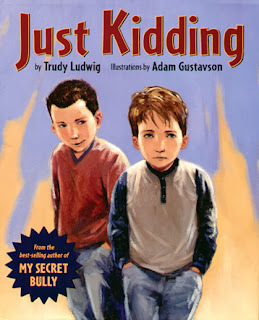 Again though this book demonstrates the sort of outcome a child would like in a book about bullying, it sends the wrong message - that "Justice" is meted out at the end and everything turns out OK.
Again and again in children's literature, stories that feature bullying often end with the bully coming a cropper. Though even classic stories that deal with the issue can be spun around and given a more positive ending. 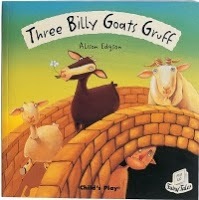 In Child's Play's version of "Three Billy Goats Gruff" the usual end where the troll is knocked into the middle of next week by the biggest goat is passed over for something rather more satisfying, and certainly more of a 'fit' with what we'd like to see more of in books that deal with the issue of bullying. There's no violence, instead there is a showdown - but resolved by Big Goat handling the situation fairly and evenly by standing up to the troll firmly. It was a very pleasant surprise to read a version of the story that worked from both the bully's and bullied parties' perspectives. Now that Charlotte takes an even more active role in our book reading sessions, it's always great to find books that she can easily read along with me and join in with - particularly big noisy books like "The Very Noisy House". Stories that build from a very simple beginning into a chaotic crazy explosion of words and pictures are always favourites on the blog. Here, the simple story of a little old lady who lives at the bottom of the house and clonks along with her walking stick expands as the dog upstairs is disturbed by her clonking, the cat above the dog is disturbed by the dog's barking, the baby above is disturbed by the cat's meowing and the birds in the attic start flapping madly as the cat's meows get louder and louder. 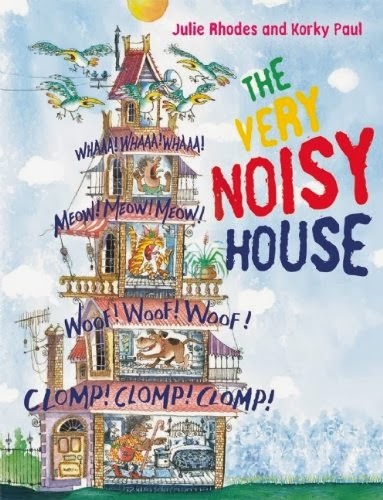 As each level of the house is revealed, the story progresses and the barks, clonks, meows, waahs and flapping get louder and louder until they explode into a cacophonic crescendo. We loved the fact that the story echoes like a soundwave, getting louder and louder, and then eventually once again getting softer and softer until it bounces back on itself - giving you the perfect excuse to zip straight back to the first page. A great story, and it goes without saying that Korky Paul's illustrations (including a cameo from everyone's favourite witch, Winnie) really make the book come to life. Probably a good idea to get yourself some earplugs for this one if you have more than one child and they're both helping out with reading duties! Charlotte's best bit: Wonderful cameos from Winnie the Witch, and the Waaah-ing baby! Daddy's Favourite bit: A wonderful book that reads like an echo-reverberation wall of sound. Superb! 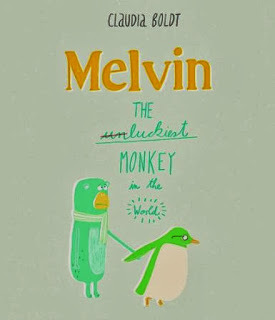 A friendship book with a difference here as Claudia Boldt introduces Melvin. He's a monkey who truly believes he's actually the unluckiest monkey in the world. People seem to avoid him in case his bad luck rubs off on them but Melvin's best friend Pete the Penguin always sticks by his side through thick and thin. One day though, Melvin's constant pessimism drives Pete to distraction and after an argument, Pete storms off leaving Melvin alone - wondering just how much more unlucky he can possibly get. After all, who on earth could be so unlucky as to lose their only friend in the world. Daddy's Favourite bit: I loved Pete, reminded me of a slightly more bonkers Pingu but again a really great friend till the end. We have loved David McKee's peerless "Not Now, Bernard" for what feels like forever. I loved David McKee's surreal and slightly irreverent but always entertaining "Mr Benn" as a kid, and we always love to see what he's going to come up with next. He might be getting on a bit now but there's seemingly no slowdown in his talent - as this book demonstrates perfectly. Isabel is a fairly ordinary little girl - with a bit of an embarrassing problem. At inopportune moments, her tummy rumbles, grumbles, growls and groans. At school it becomes the class joke and always interrupts her teachers. At home, her mum wonders just what on earth is wrong with her - and dad tells her to eat her food more slowly, more quickly or take more exercise to see if it'll sort her digestion out. Eventually the tummy rumbling gets so bad, the doctor is called in but he can find nothing wrong either. Poor Isabel becomes more and more miserable as her tummy just won't quit its noisy announcements. On a class visit to the zoo however, Isabel saves the day. 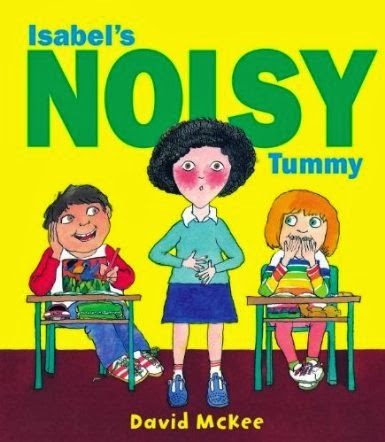 When a rather silly Zookeeper accidentally slips and opens the tiger cage during feeding time, Isabel's tummy roars just at the right moment, saving the entire class from doom. There is a rather chortlesome pay-off at the end of the book - which I hope I haven't ruined. 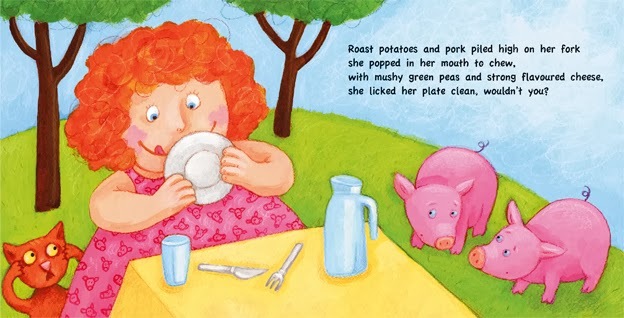 Suffice to say that some books are enjoyed purely because they mix a good dose of cheekiness with something that children Charlotte's age find endlessly amusing - bodily functions. You name it, they'll probably have a good guffaw about it, and this book makes book of the week purely for the fact that it made Charlotte roar with laughter nearly as loudly as Isabel's tummy roars! Charlotte's best bit: Oh dear, well it has to be the bit at the end. Tsk, parenting fail that she finds things like that hilarious! Daddy's Favourite bit: I'd give my eye teeth to have even a smidge as much talent as David McKee. A generation-spanning superstar of children's books and long may he continue! Owen Davy's sublime "Laika" was a well deserved book of the week not so long back. 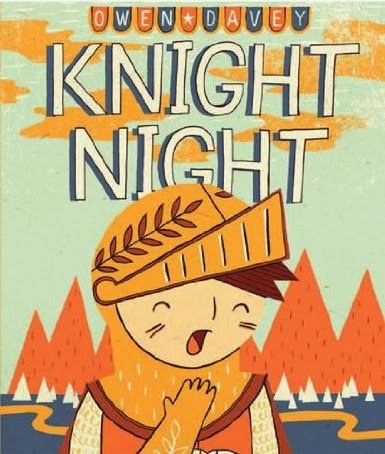 Since then we've been tracking down his other works, and "Knight Night" had been recommended to us by several folk who also think Owen Davy's books rock. We definitely can't disagree. 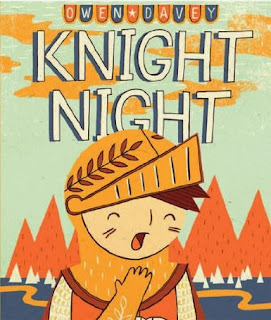 A fairly simple tale of a young boy's imagination, spurred into action as he makes his way to bed, takes on magical depths as we see his real life tightly intertwined with his imaginary quest as an armour-clad Knight, embarking on a gallant mission to fight fearsome foes atop his noble steed. We loved this very much, Owen's illustrative style is so utterly gorgeous - and I loved the constant switching between the real and the imagined. A thoroughly brilliant and wonderful book that deserves a place at anyone's round table. Charlotte's best bit: Here be dragons! Daddy's Favourite bit: Beautiful illustrations and a fabulous running theme switching between real and surreal. Wonderful stuff Owen! Rebecca Patterson's "My Big Shouting Day" is one of our favourite books, and it's also a hugely entertaining book to read aloud to children - getting them to join in with Bella's shouting and bellowing is immense fun! 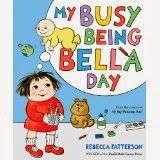 In Rebecca's sequel to "My Big Shouting Day", called "My Busy Being Bella Day" we find out what happens when Bella spends the day at nursery while her utterly cute and delightful little brother Bob is at home. Bella imagines that Bob is having a really easy day while she's having such a busy one. While Bella has to colour in a number 2, Bob is licking cappuccino foam with mum in the cafe. While Bella is playing dressing up, Bob is having amazing fun at the indoor play park. Bella just can't shake the thought that Bob leads quite a charmed life for a toddler - so what happens when Bob and mum come to collect Bella at the end of her busy "Being Bella" day? Though it's a tough thing to capture lightning in a bottle twice, and though we didn't quite go as crazy for this story as we did the first Bella book, it's still brilliant and funny - and we just couldn't resist adding it to our heaving bookshelves. Kim Reynolds is the author of the award-winning Radical Children’s Literature (Palgrave MacMillan: 2010). She is a Professor of Children’s Literature at Newcastle University and is the former President of the International Research Society for Children’s Literature. She will be joined by the 2012 Little Rebels guest judges: award-winning children’s author, Elizabeth Laird and Bookstart co-founder, editor and Eleanor Farjeon Award recipient (2006), Wendy Cooling. 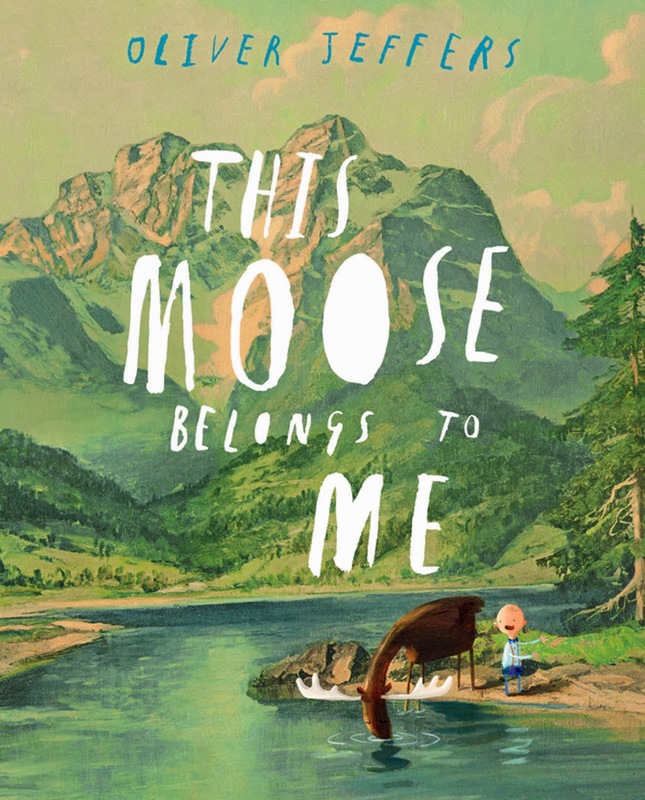 When I first spotted the cover of "This Moose Belongs to Me" nestling in a bookshop a while ago, it instantly triggered my internal jukebox and made me think of Goldfrapp's awesome album "Felt Mountain". You see, that cover - with the soaring skies and rugged landscape, and the trademark Jeffers-style characters, made me want to dive in and live inside the book. Luxurious and instantly eye catching. I was a bit unsure what Charlotte's reaction to this would be. She wasn't that keen on Jeffers' recent "Hueys" books but did indeed love the team up with Drew Daywalt for "The Day the Crayons Quit". Although "This Moose Belongs to Me" predates "Crayons" it's the sort of Oliver Jeffers book that instantly wins us back to being huge fans of his work. A young boy delights in the discovery that he has somehow inherited a moose, named Marcel. Marcel is an adequate pet. Sometimes he follows the boy's strict rule book and guidelines - all the things a pet should be and should do, sometimes - inevitably - Marcel doesn't. The delicious subtlety of the book is that Marcel is blissfully unaware that he belongs to the boy. In fact Marcel does his own thing all of the time, the pure coincidence that he sometimes plays ball is part of the brilliant humour of this book, and certainly something that Charlotte picked up on - particularly when, halfway through the book, Marcel seems to belong to someone else entirely. A battle of wills ensues. The boy vs the old lady who also believes the moose belongs to her. Downhearted, the boy sulks - and gets into trouble, tangled in a thicket and seemingly stranded in the middle of nowhere. Who could possibly save him? The rest of the story is yours to discover (including the brilliant way the book ends, almost tucked away in the end papers). Fall in love if you will (as I did) with the utterly gorgeous illustrations but here, it's Jeffers' writing that impresses - and the undertow that catches you in its thrall as you sit there, looking at your own pet, wondering who exactly owns who! Daddy's Favourite bit: Sumptuous illustrations are only half the story here. The nature of our relationship with animals, with the environment, with our belief that we truly own anything is uncovered and laid bare in such a subtle and beautiful way. Damned fine bookage Mr Jeffers. Some children's books are so beautiful that we lose ourselves to them every time we pull them off the shelves and enter their worlds. Some author-illustrators make their craft look so effortless that it makes an artsy type like me weep that we'll never possess the ability to produce such stunning work. 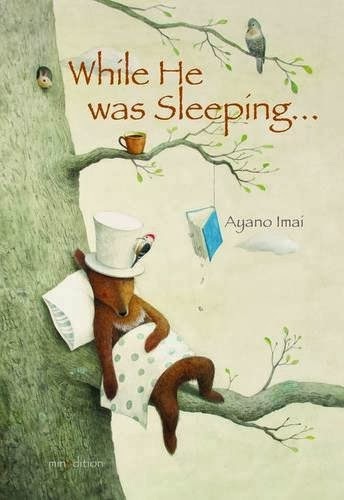 There's so much to enjoy here in Ayano Imai's beautiful "While He Was Sleeping" as the story wraps itself around you like a gorgeous double-duvet. Charlotte couldn't quite decide whether the main character, Mr Brown, was a fox or a bear (we settled on a Tanuki). Leading a lonely existence, Mr Brown wants for nothing, but when a cheeky woodpecker pecks a hole in Mr Brown's rather natty tall white top hat, it's the beginning of a complete change in Mr Brown's life. The woodpecker soon invites other birds to take up residence in his hat, and soon a whole flock of different birds have moved in. Mr Brown changes. Now, rather than spending his days shopping for gorgeous suits, Mr Brown begins to love having his feathery friends around. But as seasons change and hibernation time comes along, birds fly south for the winter and soon he's back to being very lonely again. There are a handful of artists who can produce such beautiful painted works for children's books that we jump at the chance to pick up each and every title they're involved with. Levi Pinfold, Anthony Browne and of course Ayano Imai belongs in that much revered collective. If you've loved Imai's previous (utterly gorgeous) books, you're really going to love this one. Charlotte's best bit: Poor Mr Brown coping (rather poorly) when his new-found friends desert him as the weather turns cold. Daddy's Favourite bit: So many deft and gorgeous little artistic touches that make each illustration and panel so deep and detailed that you could fall into it like a stone into a gilded pond. Gorgeous! How do you know if you've had an elephant in your fridge? You'll see huge footprints in the butter! How do you know if you've had a mammoth in your fridge? Well, you may not know until one day, like the dad in this story, you fancy an icy cold beverage and instead find a huge hairy beast folded up into the space between your Yakults and your Sour Cream and Chive Dip. It's not exactly sanitary is it! Ew! Dad panics, Mum runs around like a lunatic - and a little girl and her brother help to give chase. Mammoths are canny beasts though, and soon the hairy elephantine fellow heads straight up the nearest tree to hide. Even a local fire crew can't winkle him out of his comfortable spot up the tree, so the family and the firemen play a waiting game - to no avail. The best thing about this book is the twist - which we'd ruin if we revealed so we won't! 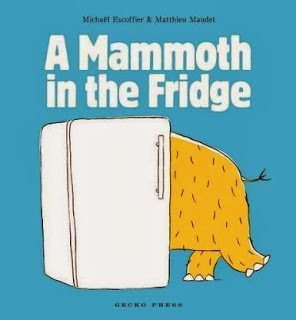 Suffice to say that there was indeed a very good reason the mammoth was in the fridge and it's up to you to pick up this book and enjoy finding out exactly why! Funny and cute in equal amounts. We definitely don't recommend keeping prehistoric pachyderms in your icebox though, just pick up a copy of this brilliant book instead! Charlotte's best bit: The rather brilliant twist and what happens at the end of the book. Daddy's Favourite bit: A crazy and slightly surreal situation that breaks out into belly laughs later on as you figure out the twist for yourself too. For years, our family cat (also called Suzy) was a well loved member of the family. Probably a huge part of why I love cats more than dogs is because I spent most of my early life growing up with that gorgeous moggy (she lived to the grand old age of 20 and right up till the day she died, she would always "answer" if you called her name with a chirpy little 'meow'). The Suzy in Tony Ross's book isn't quite as loveable as our family moggy. In fact she displays some very typical cat like behaviour. Treating human beings as nothing more than animated tin openers. Shredding furniture and soft furnishings in the pursuit of perfectly sharpened claws - and (ugh) leaving little half digested presents around the house as treats for everyone. Such antisocial behaviour ends up with Suzy feeling distinctly in the dog house, and her "humans" more than a bit ticked off. But one day Suzy looks decidedly peaky. Prime salmon instead of the usual cat food, plenty of fuss, milk and praise doesn't bring Suzy round but after a quick visit to the V.E.T Suzy slowly gets back to normal. Told through Suzy herself, it's amusing as she confides in her doggy chum that being 'ill' was part of the plan all along! How sneaky! Tony Ross always produces the most amusing and brilliantly illustrated books, and we loved Suzy's regal airs and graces, a grand feline dame very much like our own Suzy. Charlotte's best bit: Suzy turning the sofa into shredded wheat! 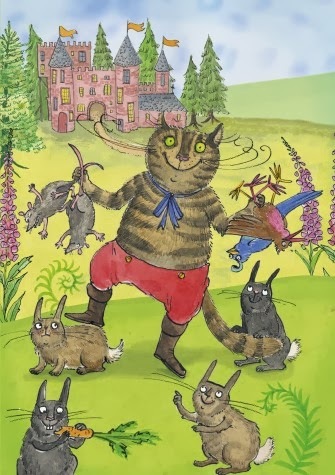 Daddy's Favourite bit: A perfect summary of cat behaviour captured in children's book form. 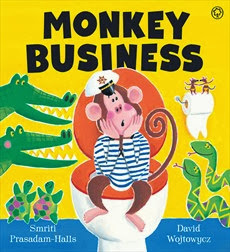 Here's a rather smashing little book that teaches children to overcome their toilet-training fears, as we meet a rather cheeky little monkey who happens to live aboard Noah's Ark. When his potty goes missing one day, just as the little fellah urgently needs to go to the loo, he searches high and low to no avail. Monkey is worried about sitting on the "big toilet" but there's nothing to be afraid of, and being extremely brave he manages to learn how to sit comfortably and do what comes naturally. We loved David Wojtowicz's fun characterisations, and Smriti Prasadam-Halls' fantastic way of showing that going to the loo is nothing to be worried about. A fabulous idea for a book, so if your little one (like ours) has some anxiety issues with toilet time, help them learn to love the loo like Monkey! Charlotte's best bit: Where Monkey finally finds his potty! Daddy's Favourite bit: Definitely a novel and rather great idea for helping children overcome loo anxiety. Huge applause for that! 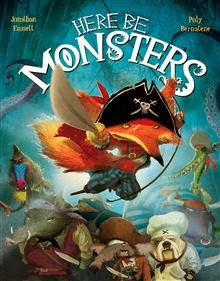 #ReadItMD13 Theme Week - "Pirates Revisited"
"Here Be Monsters" by Jonathan Emmett and Poly Bernatene. Brilliant piratical fun! Pirates - they're never far from children's books, and we have covered a multitude of brilliant pirate-themed books on our blog over the years. We thought we'd revisit one of our favourite subjects for this week's #ReadItMD13 theme as quite a few new books have cropped up on the blog this year. Let's start with an absolute belter. Jonathan Emmett and Poly Bernatene's fantastic "Here Be Monsters" which has all the right elements of excitement, adventure, monsters and booty that we demand from a cracking piratical tale. Captain Cutthroat and his fearless crew (who are all brilliantly illustrated - along with the captain himself - by Poly Bernatene) set out in search of treasure but soon fall foul of some serious beasts out in the middle of uncharted ocean. All children will find a favourite character in this, and Jonathan Emmett's pacey writing keeps you on the edge of your seat right up until a brilliant twist of an end! Don't miss it! "Pirate Girl" by Cornelia Funke and Kerstin Meyer. Utterly awesome! We can't let any pirate theme go by without talking about this fabulous book. "Pirate Girl" by Cornelia Funke and Kerstin Meyer. 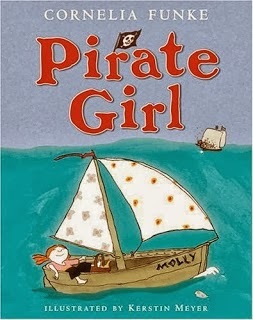 It's all too rare to see pirate books with a female lead - particularly one as brilliant (and inspirational) as Pirate Girl. Rather than relying on her sword, she relies on her quick wits when Captain Firebeard, the infamous and rather inept pirate captain kidnaps her and puts her to work in the galley. Pirate Girl has a plan though - she slips notes over the side to call for rescue. It arrives - and how! Charlotte loves the book so much that she even dressed as Pirate Girl (here holding yet another brilliant pirate book, "The Pirates Next Door"). "Yo ho ho and a bottle of strawberry milkshake"
Something for younger readers that's chock full of pirates, is entertaining and funny, and a great way of learning to count? 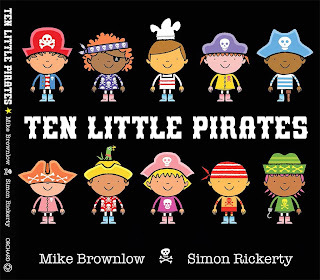 "Ten Little Pirates" by Mike Brownlow and Simon Rickerty. Fabulous counting fun! 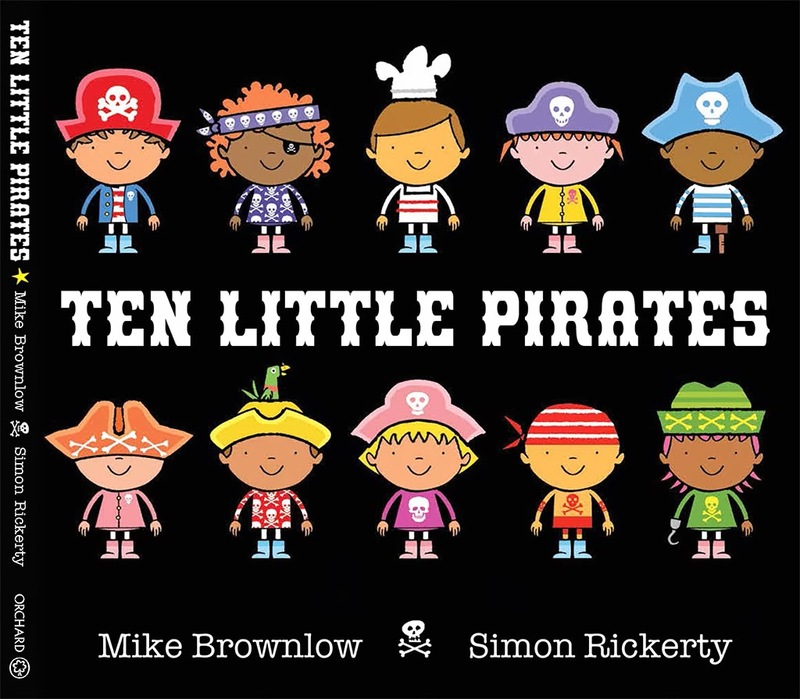 "Ten Little Pirates" by Mike Brownlow and Simon Rickerty sees ten salty coves embarking on a brilliant quest with danger at every turn. Starting with ten, children count down as each pirate comes a cropper - sometimes in a rather unfortunate way. Don't worry though, pirates are hardy characters and they all reunite at the end of the book for a jolly pirate picnic! We absolutely loved the rhyming text and the wonderfully inventive pirates, a favourite for everyone! "Plunge into the Pirate Pool" by Caryl Hart and Ed Eaves. Steampunk swimming in a pirate style! 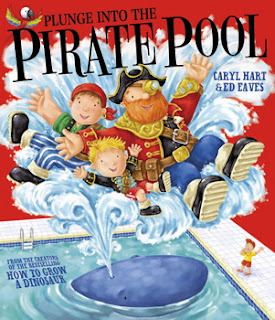 "Plunge into the Pirate Pool" by Caryl Hart and Ed Eaves is a brilliant addition to the "Albie" series by Caryl Hart and Ed Eaves. 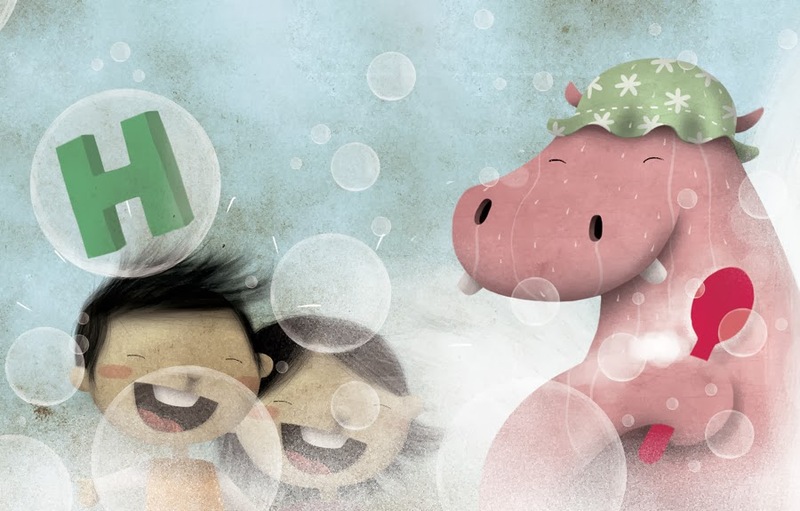 Joining Albie as he goes swimming and lets his imagination run riot with a pirate crew and the most fabulous shark-shaped submarine ever, we learn a little about addressing fears and uncertainty. It's also another all too rare book with a girl pirate character, we really wish more folk would let the girls have a go. We'd love to hear about your favourite pirate books. Drop a comment below or tweet us @ReadItDaddy with your suggestions!